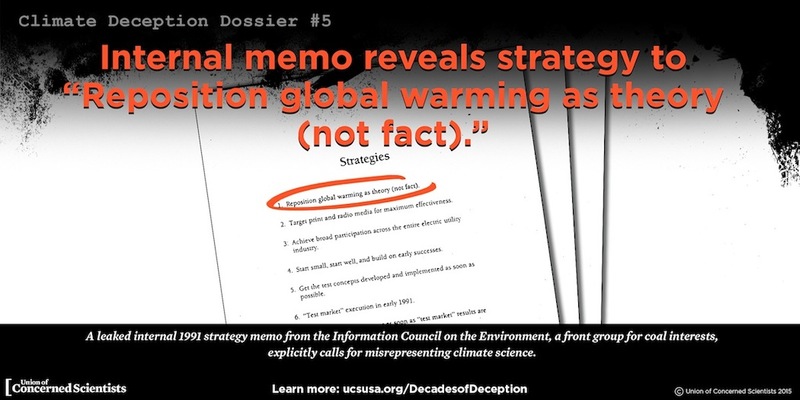 You need only place the first three words of the Union of Concerned Scientists organization name within quote marks followed by the word “dossiers” into a Google search to see just how widely mentioned the UCS’ “Climate Deception Dossiers” are mentioned across the internet. 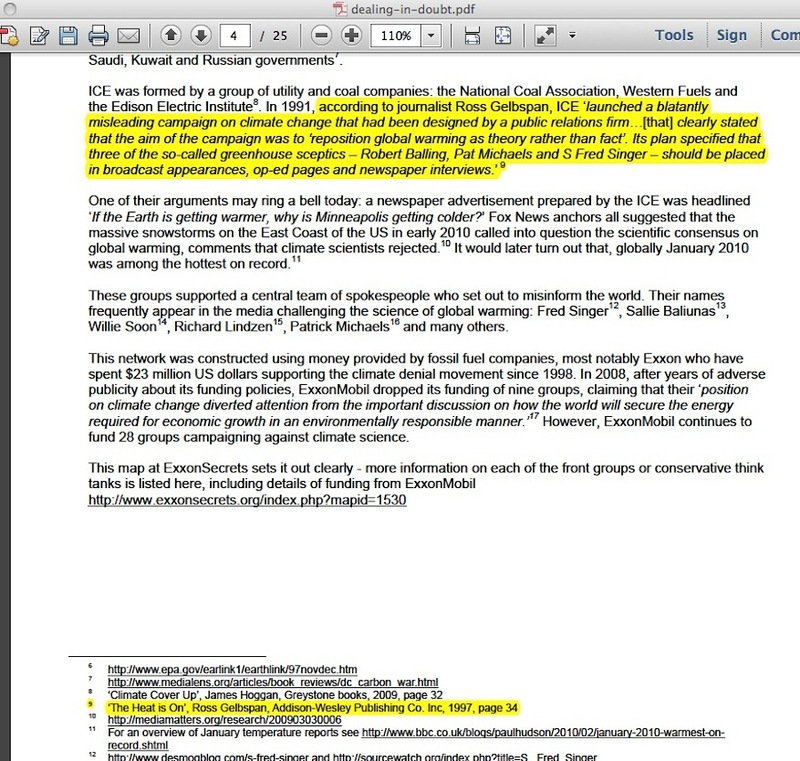 A particularly prominent one is Dossier #5, where the UCS clearly loves (as I pointed out in my July 9 blog post) a document scan out of Greenpeace’s old collection (click image below, to enlarge) of the Western Fuels Association’s “Information Council for the Environment” (ICE) documents – the ones with the so-called ‘leaked strategy memo to reposition global warming as theory rather than fact’. 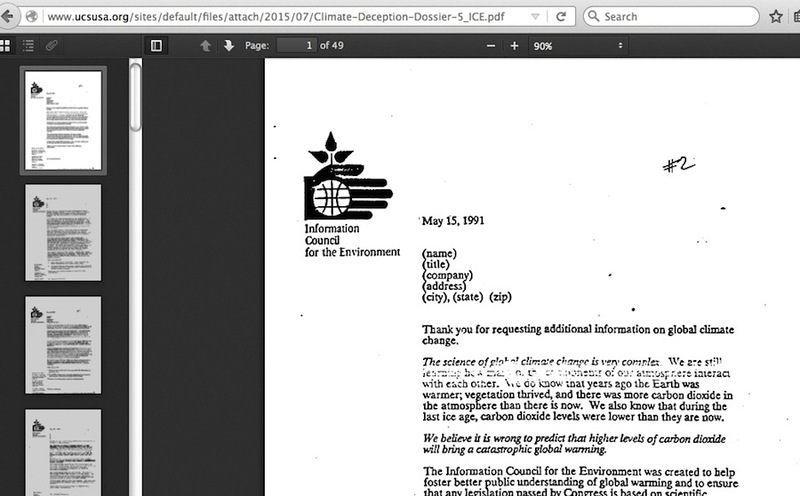 But why has Greenpeace itself not loved this same scanned memo evidence ever since 2007? The first time I can find so far of a major online entity linking directly to those Greenpeace scans was the Desmogblog organization in 2013, as I noted here, but I must point out an additional wrinkle to this in item #4. 2007 was one year before Greenpeace USA Executive Director John Passacantando left Greenpeace. The first of the 50 pages shown in the Greenpeace scans, the collection starting with the Ozone Action logo, certainly would have been familiar to Passacantanto. He merged the organization he founded into Greenpeace USA in 2000. 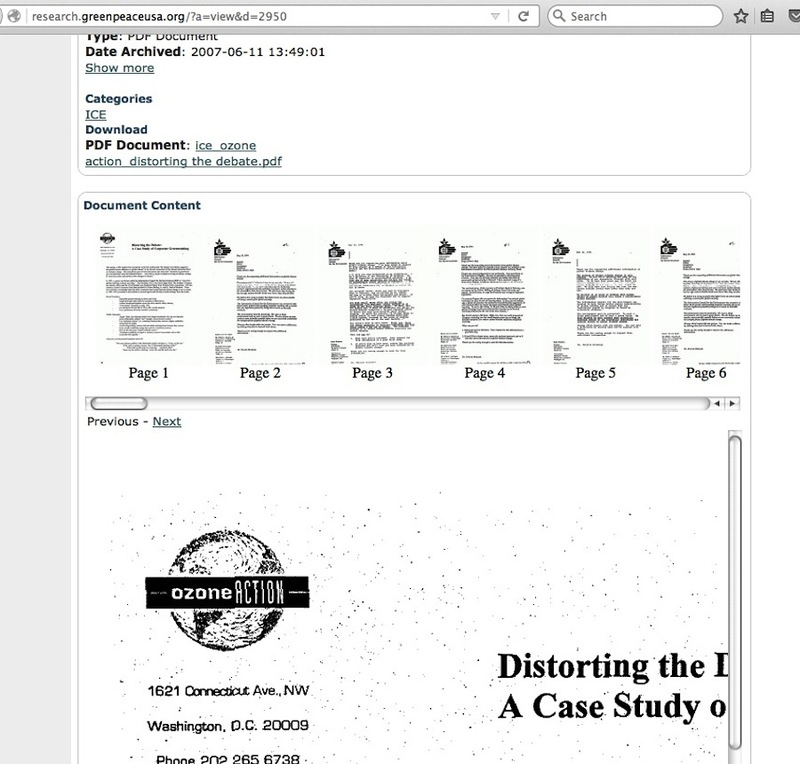 So, rather than this ICE memo scan collection (minus the Ozone Action cover sheet) debuting just this summer courtesy of the Union of Concerned Scientists, there is no reason why it couldn’t have debuted fifteen years earlier at Greenpeace. As the head of Ozone Action, Passacantando would have known about these memos as early as sometime in 1996, as key phrases were prominently quoted from them in Ozone Action’s May 1996 “Ties that Blind” report. 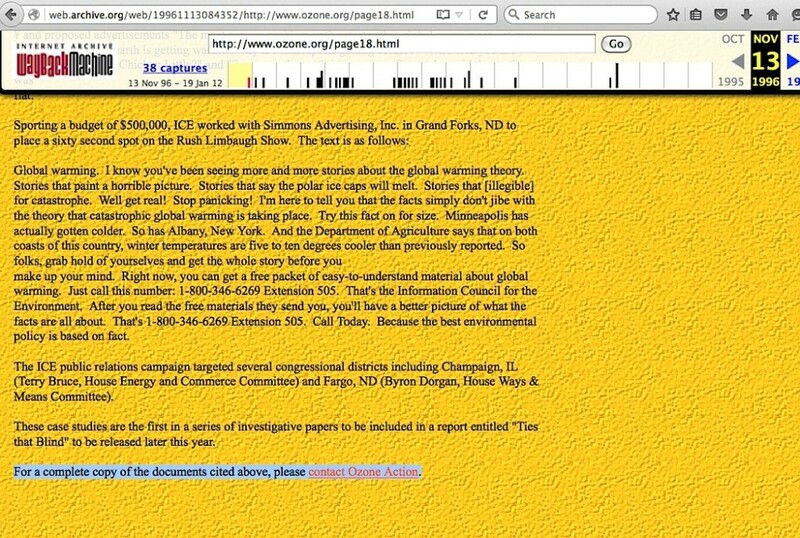 So, rather than this ICE memo scan collection debuting fifteen years ago at Greenpeace, there is no reason why it couldn’t have debuted nearly 20 years earlier at Ozone Action. 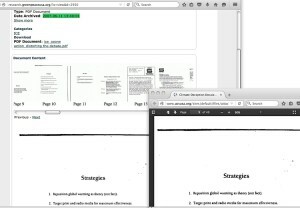 But as I’ve said all along, I haven’t seen those ICE memos openly displayed anywhere, at Ozone Action (apparently only copies could be seen upon request), at Greenpeace, or otherwise until the cursory link at Desmogblog in 2013. 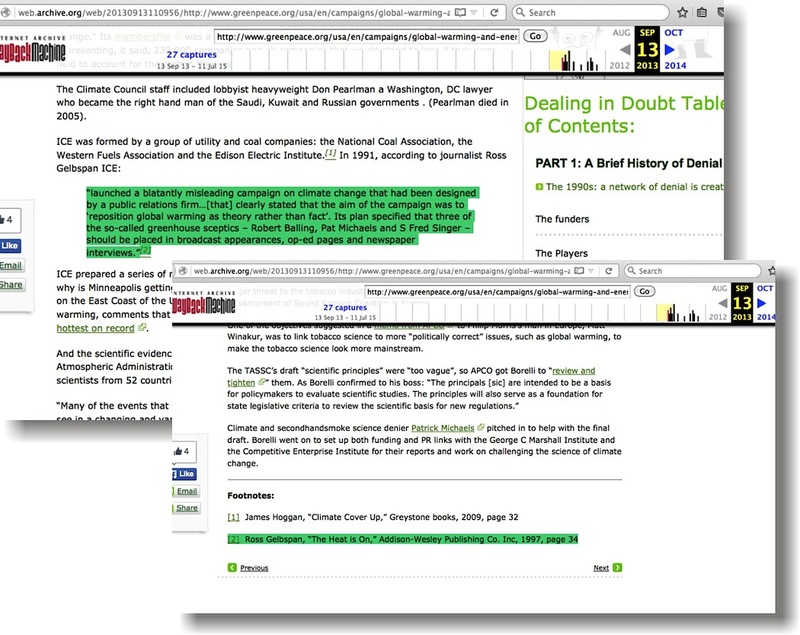 Now, the wrinkle to all of this: It isn’t until anyone actually clicks on the first link within Desmog’s “ICE” subsection (screencapture here so nobody misses it) that they see it takes them to a Greenpeace archive collection page. 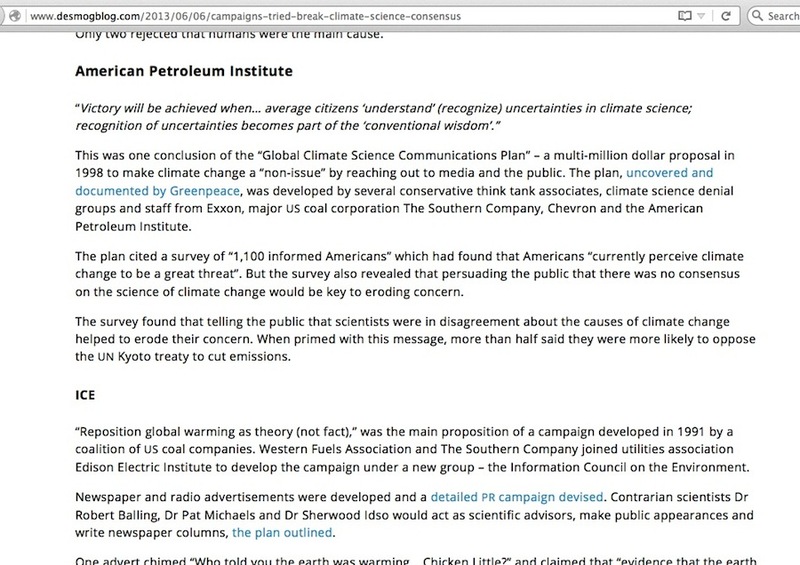 Given that just above the “ICE” subsection at Desmog’s page is one on the American Petroleum institute containing the statement “uncovered and documented by Greenpeace”, readers might interpret that the ICE memo scans stemmed from Greenpeace investigative efforts. 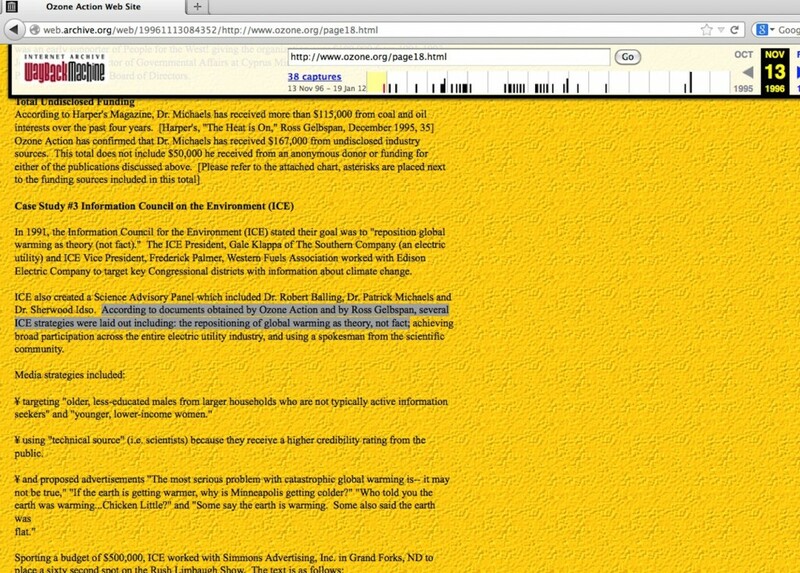 But click on the “uncovered and documented by Greenpeace” link at Desmog’s page and where does it go? Despite this being a perfect time for Greenpeace to cite their own archive scans and tell the world all about where they came from …… they cited Ross Gelbspan. Who has yet to tell the world where he got his copies from. 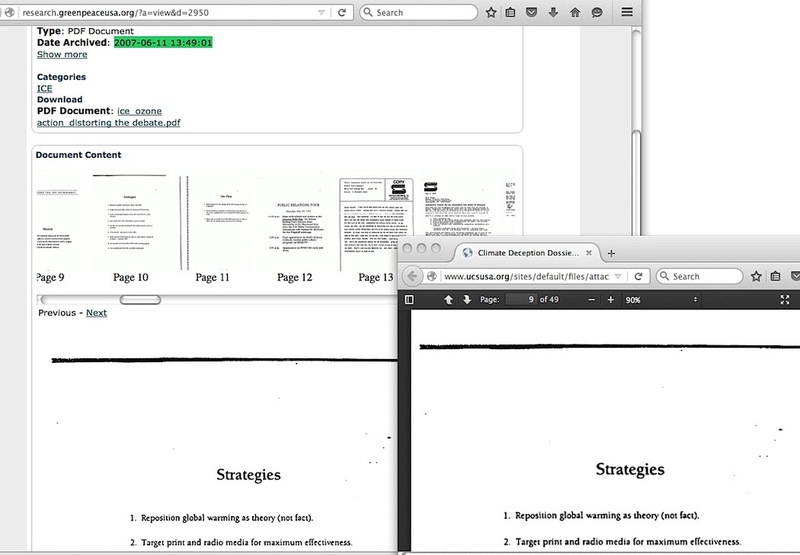 Meanwhile, Greenpeace loves to cite lots of other material in their archive scans. Just not that particular scan archive. Why not? Elemental, when anyone takes the time to carefully read through the ICE docs. For all the effort to portray the “reposition global warming as theory rather than fact” phrase as evidence of a sinister top-down industry directive, it is clearly obvious that it was little more than an oddly worded way of saying the goal of Western Fuels pilot project PR campaign was to show how the supposed ‘settled science’ of man-caused global warming was not actually settled. 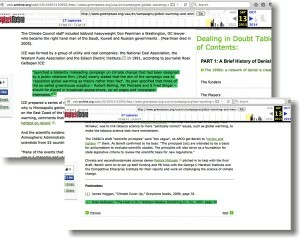 Why was Desmogblog and the Union of Concerned Scientists suddenly in love with Greenpeace’s ICE scans? I don’t yet know what triggered this unrequited love, but apparently the Desmog people didn’t bother to look into the Greenpeace scans in any depth, and the UCS people were only bright enough to delete the first Ozone Action page when they copied ‘n pasted the collection into their site. 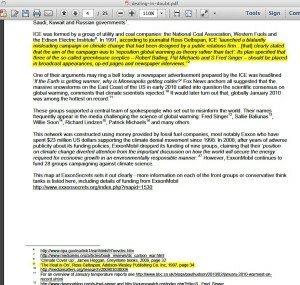 Why does the current administration at Greenpeace not suggest UCS’ citation of those ICE scans is politically suicidal? Probably because they don’t have first-hand awareness of the problem, as the last of the old Ozone Action trio administrators at Greenpeace left in the spring of 2014. This entry was posted in Information Council for the Environment, Ozone Action, Western Fuels Association and tagged John Passacantando, Union of Concerned Scientists by Russell Cook. Bookmark the permalink.